Morningstar.com today has an article on the performance of 20 largest stock fund firms. The stock funds mainly invest in domestic stocks and one firm may have multiple offers in this area. If that's the case, the author noted that the performance of all these funds may approach average as it's difficult for all of them to be outstanding. If you are considering investing in stock funds, then the article may help you decide where to put your money. Dodge & Cox has only one domestic-stock fund – the closed Dodge & Cox Stock (DODGX) – and it now has $64 billion in assets. 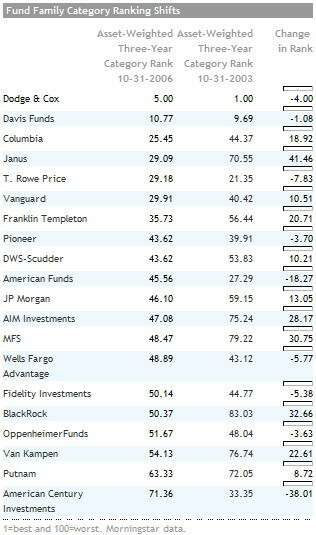 But kudos to the firm for continuing to produce great relative performance. Although its showing in 2006 has been middling, the fund has beaten more than 90% of large-value funds for the three-year period and that follows a great performance the prior three years (from 2001 through 2003) in which it beat 99% of its peers.